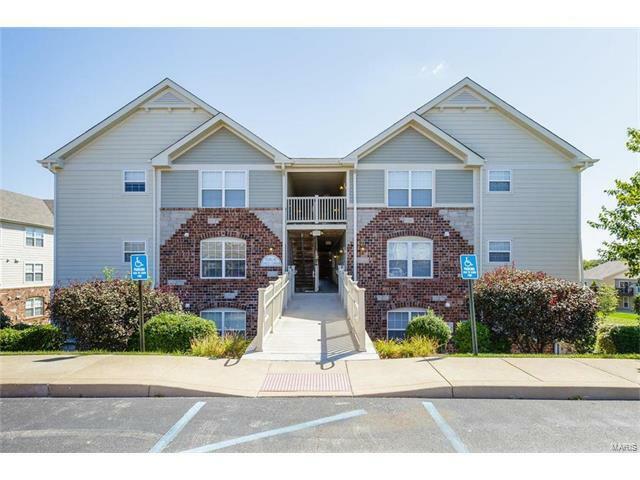 Gorgeous, top floor condo loaded with upgrades in a fantastic location! There is an assigned covered parking spot, a deck overlooking common ground, only 1 flight of stairs to your door, fantastic access to Hwys 364, 94, 40 & a short commute to Chesterfield Valley. Features inc 2 BD, 2 BA, vltd ceilings, 42” Maple cab, st steel appl, pantry, refrig-washer-dryer stay (as is), D/W, micro, stone backsplash, sm top stove, ceramic tile flrs, W/I closet, private Lndry Rm, raised height bath vanities, door keypad, sec system & more. There is a private covered deck & storage closet. Enjoy low maint living w/your mail conveniently delivered outside your door. This is an all-electric home. A monthly fee covers trash, water, sewer, common area maint, lawn care, landscape & snow removal (per C&R’s). Enjoy a beautiful community lake & walking trls. Quaint downtown Cottleville is nearby & Golds Gym is in walking distance. There are grocery stores, restaurants & services on nearby Mid Rivers Mall Dr.
Hwy 94 to Florence Drive to Left on Montecito Terrace to Left on Piedmont. The building is the last building on your left next to the common ground and single family homes.